Here are the two Langton ships which got stalled in the paint queue with all the Medieval madness recently. In fact, Richard III has been finished, but needs to be photographed outdoors being so large, and the sun never made its appearance today through the heavy fog. The two ships are painted up in blue as I needed a few more command ships for the "blue" fleet. I think the Octeres is one with the paired oars. Being so tiny, they painted up in no time at all by picking out the details over a black basecoat. The bases are made from plastic card and textured acrylic caulking. Hopefully the sun will come out tomorrow for a photo-op for Richard and White Surrey. The model is so large that the camera flash reflects off the armor and ruins the photo. For the record, I relabeled some posts to make it easier to find stuff (at least for me anyway). “Saddle White Surrey for the field tomorrow; Look that my staves be sound, and not too heavy.” Here is the mount for King Richard III from the "Gold Knight of Nice" kit in 1:8th scale. Rust-oleum Bright Coat Silver was used for the armored parts. It's give a really nice finish. I chose not to black-line breaks in the armor plates as I liked the clean look. It's a quick build with minimal parts; only the large size made handling it sometimes challenging while painting. Here he is next to a 28mm BTD mounted figure to give a sense of scale. Richard is up next - and although a few more parts should be a lot easier being a more manageable size. 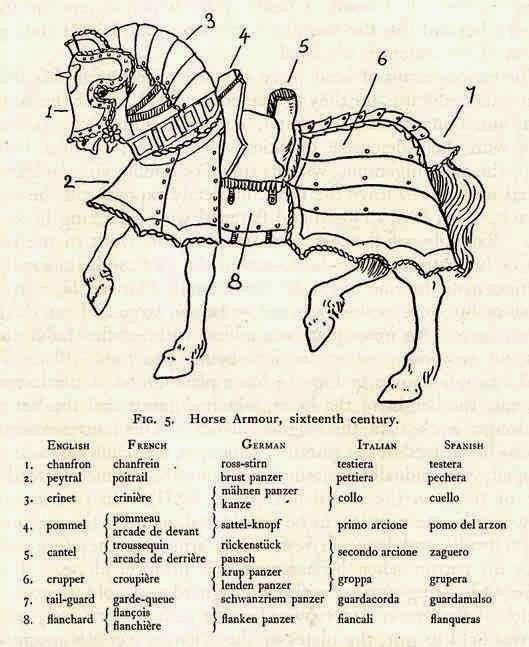 Below is a nice illustration identifying parts of the horse armor. Just a quick diversion with this a 1/8th scale re-issue of an old Aurora plastic kit of "The Black Knight of Nurnberg). I had the kit back in the early-70's - of course, it long since disappeared. So it was nice to see it has been re-issued and available at a fairly low price. The original set was released in the late-1950's. Don't know why his left eye looks so white and crazy - might be the flash, but in normal view doesn't appear so wide-eyed. 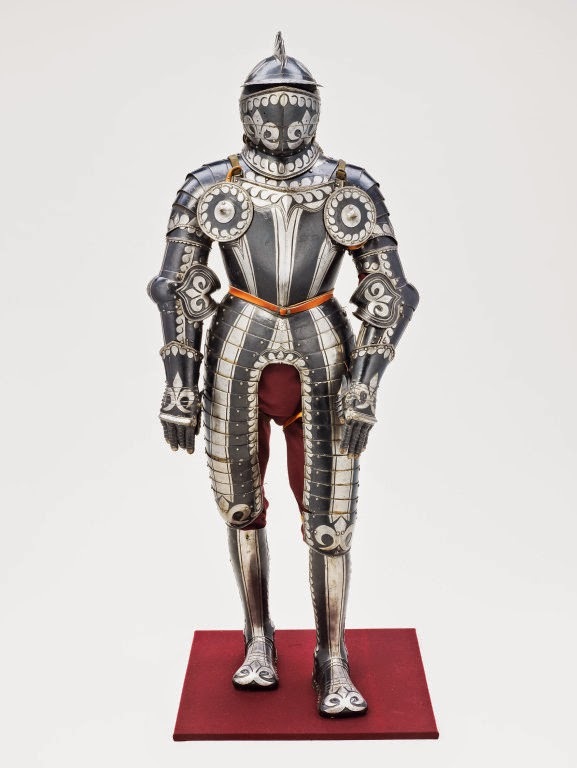 The style of this type of late 16th C. armor is known as "Black and White," and associated with Northern Germany. It is made by either painting or bluing selected areas of the metal. It's simple, yet quite elegant looking. I painted it by spraying it with an old can of Krylon Brilliant Silver. I picked up a new can but it had a different type of spray nozzle which made the paint come out too runny. It also might be that the paint mixture is flawed. Black was then painted over the select areas. Another error I made was using Krylon Clear Satin - which left the black areas splotchy looking. I went over it with some Krylon Gloss which helped a little. If I were to do it over I would've went with a gloss finish. The kit is made up of minimal amount of parts which fit together very well. The only part that I needed to fill a little was the seam at the base of the gorget. Below is an image of what the armor is based upon. Although the actual armor's non-painted areas aren't engraved as it appears on this model. Finally, here's a shot of the Black Knight along another ebay purchase from a few years ago. It is the "Red Knight of Vienna." This is the original kit that was molded in red plastic. I bought it painted and soaked it in DOT3 brake fluid to remove the original paint job and repainted it. There is a 28mm BTD knight between them for size comparison. I hope to get started on the "Gold Knight of Nice" next. Well here are the six figures from the FireForge Mounted Sergeants-at-Arms box - all painted up as notable knights for the period. The other half of the set were painted up as mounted yeoman archers. 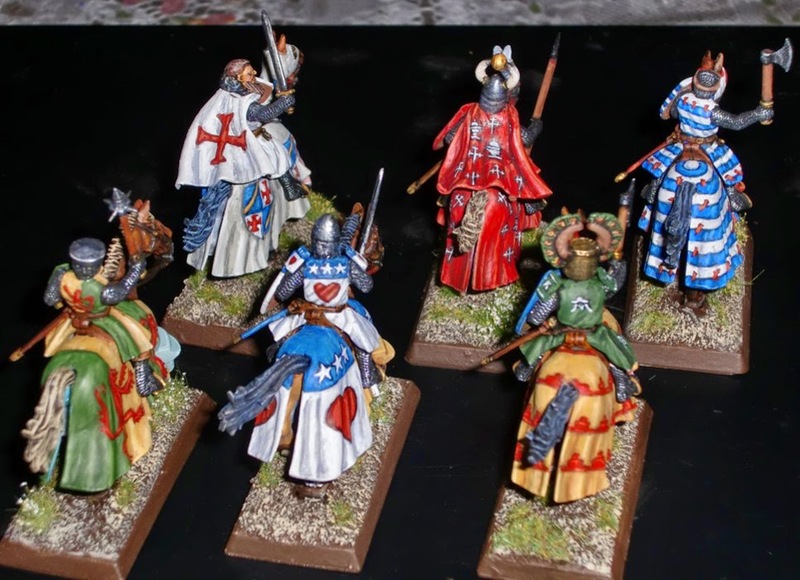 The knights are, from left to right in the image below; front row: Roger Bigod, Giles d'Argentan, Jacques de Molay; rear row: Aymer de Valence, Konrad von Limpurg, Archibald Douglas. As this particular set doesn't come with great helms, only the heads for Roger Bigod and Aymer de Valence are from the kit. The great helms are Mirliton spares I've had for some time. De Molay's bare head is a GW Empire spare. 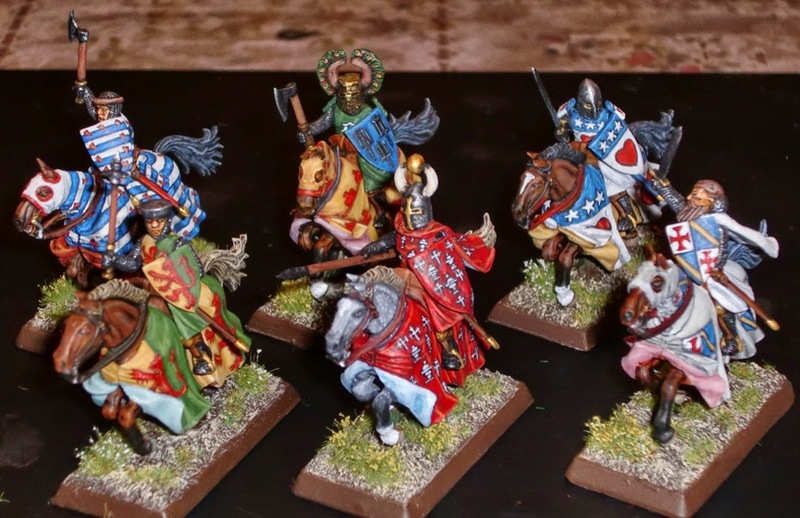 It's really nice that Lion Rampant MAA units are only six figures each. Anything larger tends to make painting tedious. 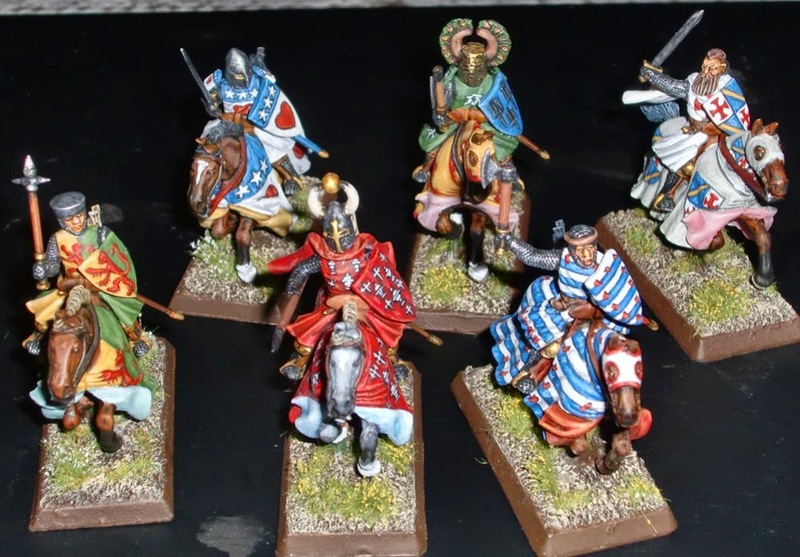 As these are from the same period as my Early-HRE army, they could be fielded along with them to bolster that army or for games larger than Lion Rampant. The funny thing is that I don't have any figures representing Teutonic Knights - and they were the first release from FireForge. Someday maybe. Thanks for following this little project. As I took advantage of the recent sale from Black Tree Design, I have some more HYW foot knights to paint up in the future. This is the last figure from the FireForge Mounted MAA kit. He's painted up as Sir Roger Bigod, Marshal of England under Edward I. He bears the arms of the Marshal of England, first made famous by William Marshal a generation or so before Sir Roger. Along with most notables of the time, Sir Roger was present at Falkirk in 1298. However, he is more notably remembered for successfully challenging Edward I's order to campaign in France. Edward had ordered Sir Roger to go to Gascony while the king would go separately to Flanders. Sir Roger challenged the king by stating he was only compelled to campaign overseas while in the company of the king himself. An outraged Edward stated, "By God, Earl, you shall either go or hang." To which the earl famously retorted, "By the same oath, O king, I will neither go nor hang." Edward must have respected the earl as he departed for France without him. The earl died in 1306, after being a bit of thorn in the king's side. For instance, the earl actively prevented collection of funds for Edward's French campaigns. Spending time with out-of-town visitors this week, I finally managed to pick up a brush today and paint this guy up. He's another FireForge figure with a Mirliton helmet - painted up as a personality from the Codex Manesse. 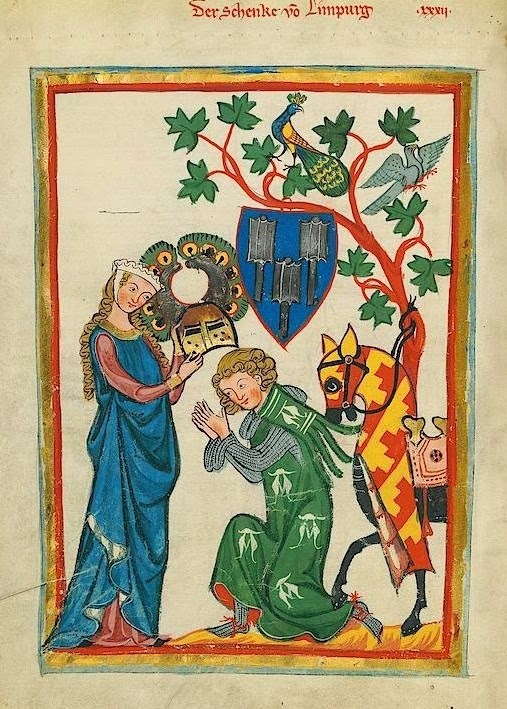 The script atop the illustration identifies him as a minstrel by the name of Konrad von Limpurg - apparently from Swabia. He's an interesting study of late-13th C./early-14th C. heraldry, as his shield, horse trapper and surcoat all bear different arms or charges. I'm not quite sure what the arms on his shield are supposed to be - possibly maces; but as the Codex has a lot of fanciful heraldry they could just as well be something like a cooking implement. The Lego design on the horse trapper may depict a castle. The surcoat and ailette charges are believed to be stylized "A's" for amour. Using a GW Empire head atop a FireForge figure - here is the last Grand Master of the Knights Templar, Jacques de Molay. His horse trapper and shield bear his personal coat of arms. His tunic and cloak are blazoned with the Templar Order cross. Interestingly, there is no record of an "official" style of cross used by the Templars, but the one used here seems common enough for them. A small bit of Green Stuff was used on the back of his neck to represent his mail coif pulled back. De Molay is said to have been born in a part of Burgundy then ruled by the Holy Roman Empire, and had joined the Templars in 1265, at the age of 21. He is believed to have been present at the Fall of Acre to the Mamluks in 1291. In 1292, he was elected as Grand Master for the Templars. The Order had relocated to the island of Cyprus after losing their foothold in the Holy Land. He even attempted to forge an alliance with the Mongols in an effort to defeat the Mamluks. "Here you see innocent people die!" "I am calling you, King Philip IV of France!" "I am calling you, Pope Clement V" "I am calling you to appear within one year from today at the Court of God in order to receive your legitimated penalty! - curse, curse, be all of you cursed until your 13th generation"
In any case, the Pope died within a month, and the king before the year was over. Added a spare Mirliton helm to this FireForge figure to represent Giles d'Argentan. Sir Giles was a Norman knight in the service of the English at the beginning of the 14th C. He served both Edward I and Edward II. Sir Giles was reputed to be "One of the Three Most Accomplish Knights in Christendom." The other two being Robert the Bruce and the Holy Roman Emperor Henry VII. Sir Giles was also hopelessly addicted to the tournament. So much so that he went AWOL to attend these while on campaigns in Scotland with Edward I. An infuriated Edward I had him imprisoned for such antics. Edward II was only too happy to pardon him and added him to his entourage. Sir Giles was a favorite of Edward II and along with Aymer de Valence was the king's bodyguard at Bannockburn in 1314. After ensuring the king would safely depart the battlefield he declared he was not the type to flee the enemy and charged back alone into the fray and to his demise. Ran out of Testors Dullcote, so used some brush on Vallejo Matte, but it appears the finish is a bit satiny; at least in the photos while using the flash. I must pick up another can as soon as Michael's puts out another 40-50% discount coupon. Another one of the FireForge plastic figures - painted up as Sir Archibald Douglas, Guardian of Scotland. He was the half-brother of Sir James Douglas who carried Robert the Bruce's heart to the Holy Land, whereby the heart was added to all future Douglas' arms - as seen here with Sir Archibald. These arms are very catchy and seem almost made up except for the actual history. The FireForge kit comes with ailettes - "little wings" in French - which were popular for a little while in the early 14th C. The Sugarloaf helm is a spare (Mirliton?) metal one as the Mounted MAA kit doesn't come with great helms. Unfortunately, Sir Archibald is best known for being the commander of Scottish forces defeated by Edward III at Halidon Hill in 1333. Sir Archibald died at the battle, along with five Scottish earls. This is the first project completed for 2015 - and I see that I forgot to paint the metal parts on the horse furniture - since corrected. Happy New Year!